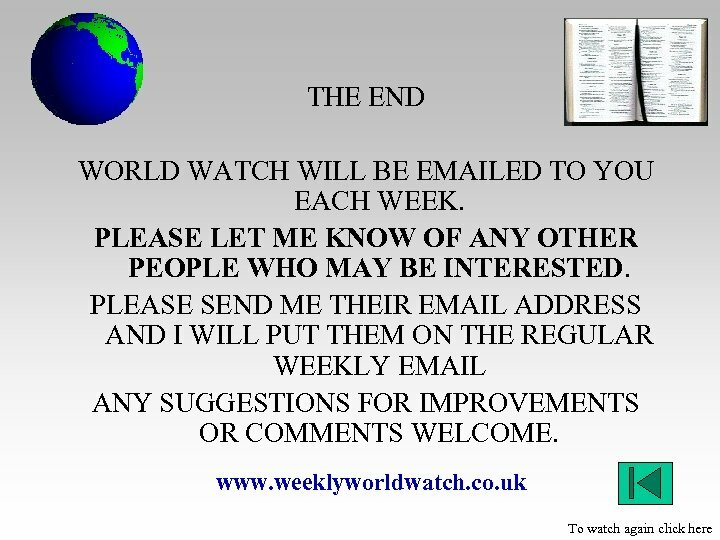 What is this world watch all about? 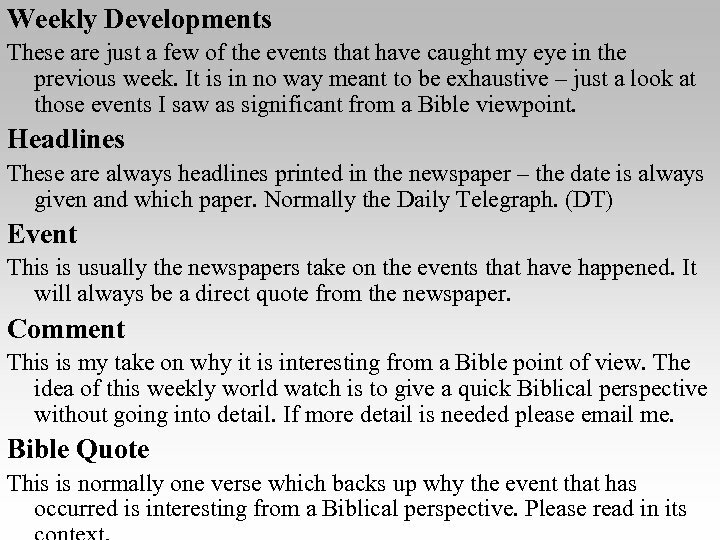 I decided each week to look at key events that had happened in that week and look at them with the Bible in hand. 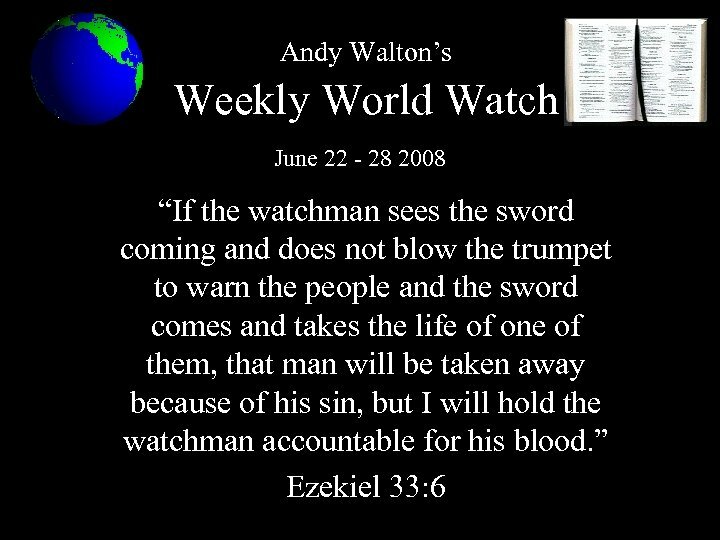 I hope to build up a picture of Gods hand working in the affairs of this world bringing about that day when all nations will be gathered to Jerusalem to battle which will be brought to end when the Lord Jesus Christ physically returns from heaven to set up Gods kingdom. The key areas which will crop up time and again will be 1. Israel – Middle East the growing conflict 2. Europe – the developing union / political and religious 3. 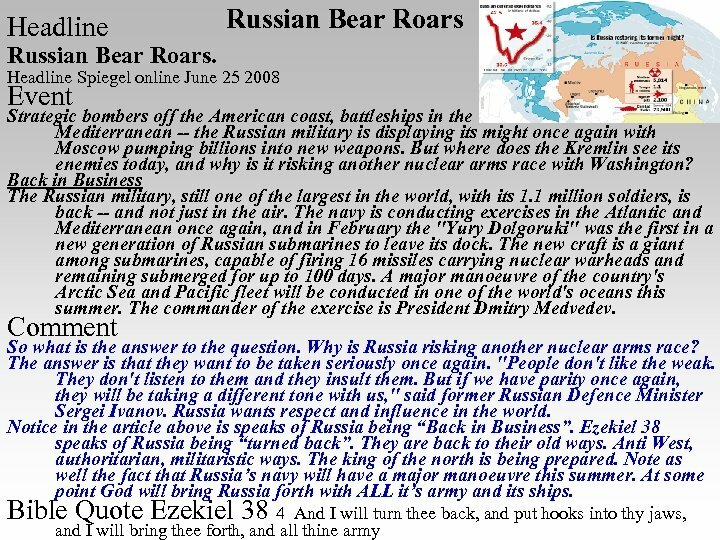 Russia – continued turning back to anti west ways 4. The development of King of South – US & UK 5. Declining moral standards and increasing violence. 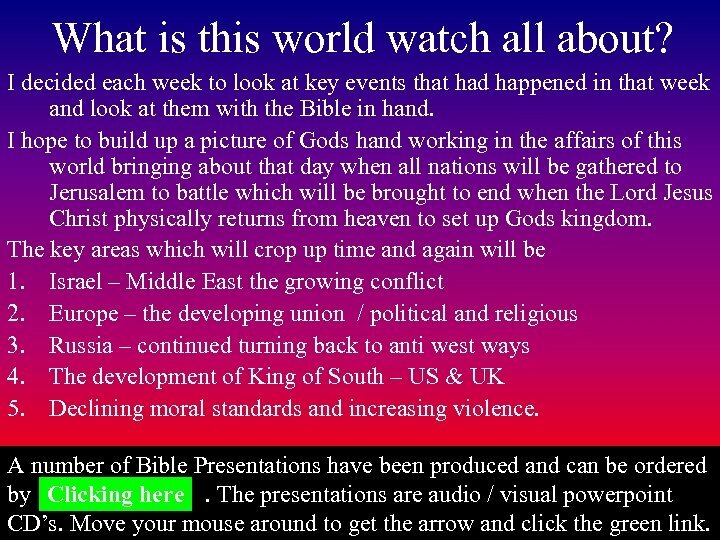 A number of Bible Presentations have been produced and can be ordered by Clicking here. The presentations are audio / visual powerpoint CD’s. Move your mouse around to get the arrow and click the green link. Headline ‘Israel must share Jerusalem’ French president says Israel must share Jerusalem Associated Press June 23 2008 Event French President Nicolas Sarkozy said Monday there could be no Mideast peace unless Israel drops its refusal to cede sovereignty over parts of Jerusalem claimed by the Palestinians, challenging one of Israel's most emotionally held positions. Speaking to a packed session of the legislature, Sarkozy called on Israel to stop settlement in the West Bank. But he tempered his address by assuring Israel that it could count on France's support in halting Iran's nuclear program. Sarkozy, whose maternal grandfather was a Greek Jew, praised Israel's democracy and quoted the biblical passage in which God promises the Holy Land to the children of Israel. Comment This was the first French state visit to Israel in 12 years. The French President, Nicolas Sarkozy said a peace agreement would allow the two peoples (Israelis and Palestinians) to live together in peace and security. The Bible says in 1 Thessalonians 5: 3 that when people are talking about and advising on “peace and safety (security)” then sudden destruction will come. Here we have another world leader “advising” and “speaking” on the subject of “peace and safety”. It will lead to destruction. Why? Well look at his advice. He is telling the Jews to divide Jerusalem. He is telling the Jews to stop building on the West Bank. He is telling the Jews to divide God’s land. Remarkably he even has the audacity to quote from the Bible where God says he will give the land to the Jews! This man may seem friendly but ultimately France along with Europe will fight against Israel. He came as a wolf in sheep’s clothing. See Matthew 7: 15. We know that anyone who burdens themselves with Jerusalem will be cut in pieces. 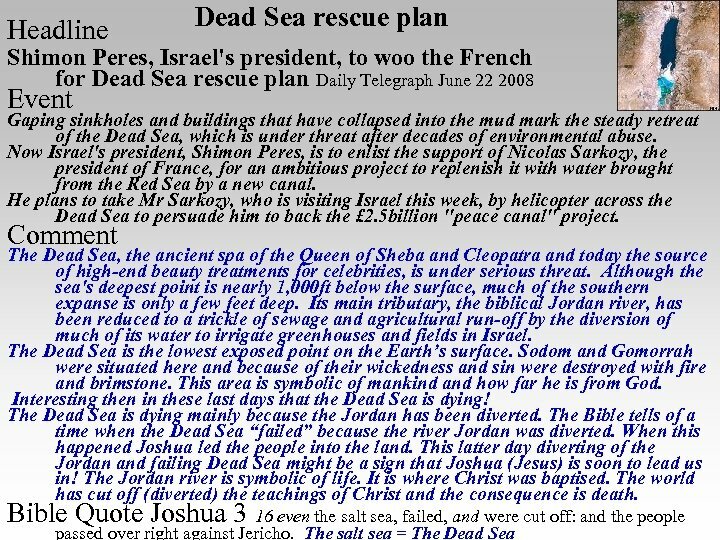 Bible Quote Zechariah 12 3 And in that day will I make Jerusalem a burdensome stone for all people: all that burden themselves with it shall be cut in pieces Mr Sarkozy is burdening himself with Jerusalem. The fate of those who do is clear…. 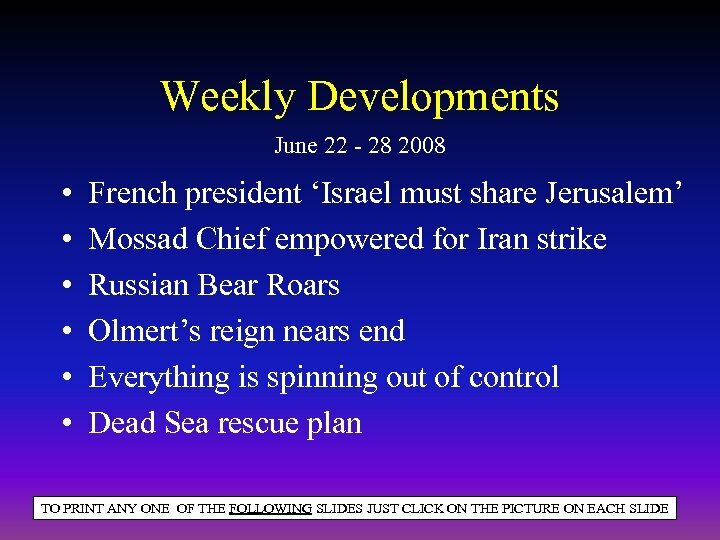 Headline Olmert’s Reign Nears End Headline Israelnews June 27 2008 Event Ehud Olmert has found himself in a fix never before experienced by any Israeli prime minister before him: His own party, Kadima, is dumping him. Its strategists joined forces with its coalition partner, the Labor party, for a deal signed Wednesday, June 25, to replace him as head of government and party before Sept. 25. 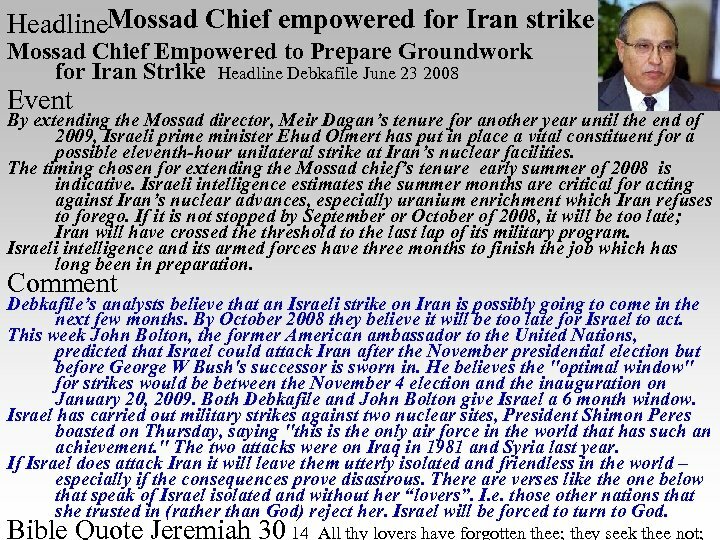 By October, 2008, Olmert will be gone, dropped by his own loyalists, and a new Kadima prime minister will rule Israel with Labor endorsement guaranteed. The present front-runners to succeed him are foreign minister Tzipi Livni, a lawyer with even less government experience than Olmert, and transport minister Shaul Mofaz, a former IDF chief of staff and defense minister. Barring unforeseen events, the prospect of an early general election this year has receded to the spring of 2009. Israel is therefore being dragged into one of the most critical three-month periods of its history, Iran’s threshold to nuclear armament, in a leadership void. The fateful decisions on whether or not to pre-empt a nuclear-armed Iran by force, with or without the United States, falls to a lame duck prime minister. Comment Israel is about to enter a very uncertain time politically. Olmert’s own supporters have paved the way to remove him from office. This is mainly due to the corruption scandals that constantly swirl around him but also due to his perceived military failures in Lebanon and Gaza. What is interesting is that during this leadership void decisions will need to be taken in Israel over the situation in Iran. As the article above says the decision will have to be taken by a “lame duck prime minister”. All this does not bode well for Israel. Their leaders have been corrupt, blind and godless. They have led the country to the brink of disaster by not trusting in God. The consequences will be a terrible war. Bible Quote Isaiah 9 16 For the leaders of this people cause them to err; and they that are led of them are destroyed. 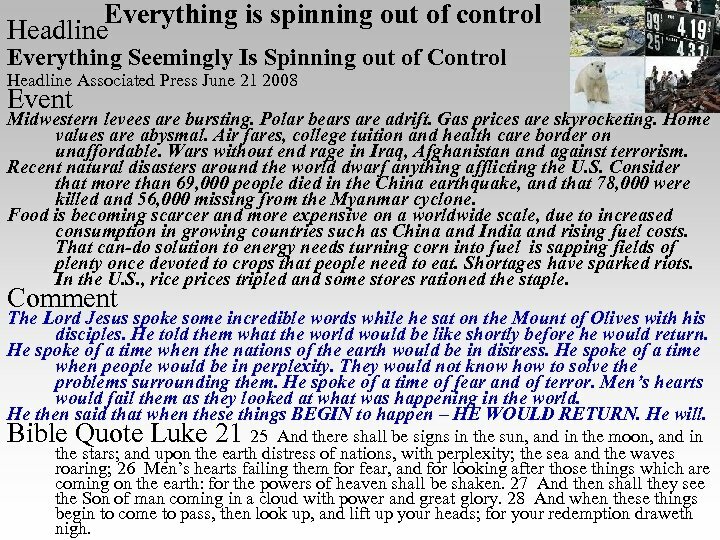 Everything is spinning out of control Headline Everything Seemingly Is Spinning out of Control Headline Associated Press June 21 2008 Event Midwestern levees are bursting. Polar bears are adrift. Gas prices are skyrocketing. Home values are abysmal. Air fares, college tuition and health care border on unaffordable. Wars without end rage in Iraq, Afghanistan and against terrorism. Recent natural disasters around the world dwarf anything afflicting the U. S. Consider that more than 69, 000 people died in the China earthquake, and that 78, 000 were killed and 56, 000 missing from the Myanmar cyclone. Food is becoming scarcer and more expensive on a worldwide scale, due to increased consumption in growing countries such as China and India and rising fuel costs. That can-do solution to energy needs turning corn into fuel is sapping fields of plenty once devoted to crops that people need to eat. Shortages have sparked riots. In the U. S. , rice prices tripled and some stores rationed the staple. Comment The Lord Jesus spoke some incredible words while he sat on the Mount of Olives with his disciples. He told them what the world would be like shortly before he would return. He spoke of a time when the nations of the earth would be in distress. He spoke of a time when people would be in perplexity. They would not know how to solve the problems surrounding them. He spoke of a time of fear and of terror. Men’s hearts would fail them as they looked at what was happening in the world. He then said that when these things BEGIN to happen – HE WOULD RETURN. He will. Bible Quote Luke 21 25 And there shall be signs in the sun, and in the moon, and in the stars; and upon the earth distress of nations, with perplexity; the sea and the waves roaring; 26 Men’s hearts failing them for fear, and for looking after those things which are coming on the earth: for the powers of heaven shall be shaken. 27 And then shall they see the Son of man coming in a cloud with power and great glory. 28 And when these things begin to come to pass, then look up, and lift up your heads; for your redemption draweth nigh.